Last week I told you about the start of my emergency quilting. The quilt took a bit longer than I wanted to get it finished, but life got in the way. This is the season of barbecues, graduation parties and fishing, so sometimes priorities get shifted. I managed to finish the top and quilt Sherry's quilt on Sunday, but the binding wasn't finished until Tuesday night. The hottest day of the year (so far) and I'm under a quilt, sewing down binding. Of course. But it's done. And it took an extra day to get a photo, but finally, here's the finished quilt! It's even got a label! I decided not to do the outer border because I was pressed for time and I think the quilt turned out just fine without it. I love the variety of hand-sizes, the variety of ways people signed their blocks and even the guy who signed his "upside-down" adds variety and personality. It finished about 46x57, which is a nice lap-sized quilt. Now I can get back to work on the Baltimore Album challenge block (started) and the monthly UFO (cut out). Maybe this weekend? I hope to have more photos soon. It is perfect without the extra border. 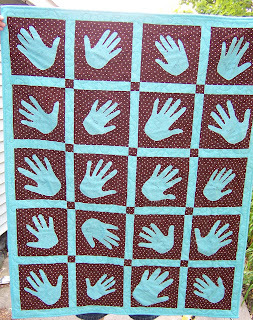 What a wonderful quilt, I know she will treasure it! 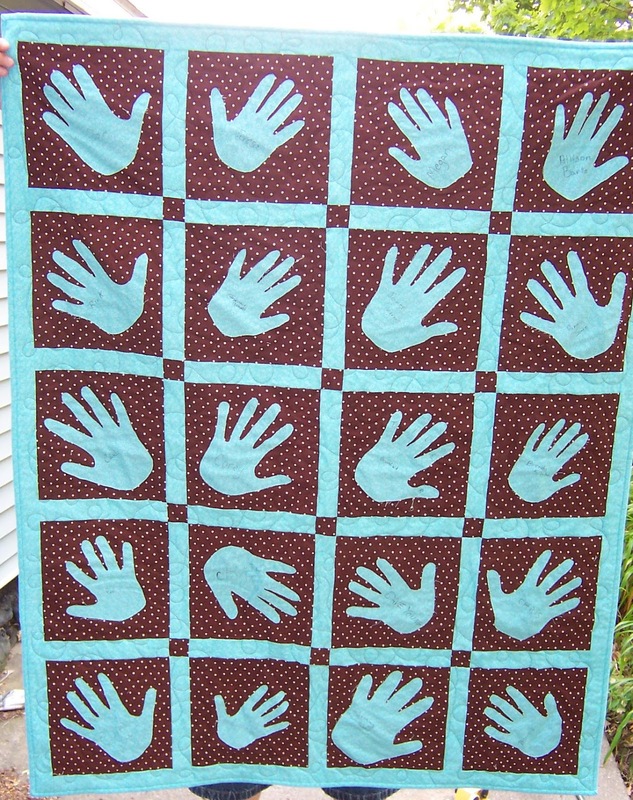 That quilt is absolutely beautiful, and will be so meaningful to the recipient! Treasured memories are made of things like that! ---"Love"
It turned out beautifully. I wouldn't have known there was a "missing" border. That is a wonderful quilt! I hope it is a comfort to Sherry as well as keeping her warm. looks great! I can't believe how fast you got that done, especially with life happening all around! What a pretty quilt. I love the way it turned out. I am sure it will be loved and used and treasured. I think you got it all done pretty dran quick.